D328 & d329 Weil baking Co. 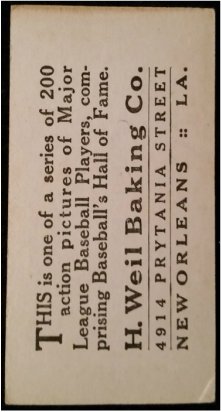 This set of cards was distributed by the H. Weil Baking Co. of New Orleans. There are two distinct variations, the 1916 D329 and 1917 D328. 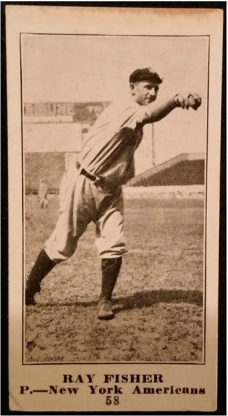 The 1916 D329 set is similar to the M101-4 Blank Backs set and shares the same checklist. The cards measure 1-3/8" x 3" and feature a black and white photo of the player surrounded by a white border. The set features 200 different cards and is numbered on the front under the player's name. The back features a promotion for H. Weil Baking. The 1917 D328 set is similar to E135 Collins-McCarthy set and is slightly larger than the aforementioned D329's. The cards measure 2" x 3-1/4" and feature a black and white photo of the player surrounded by a white border. The set features 200 different cards and is numbered on the front under the player's name. The back features a promotion for H. Weil Baking. 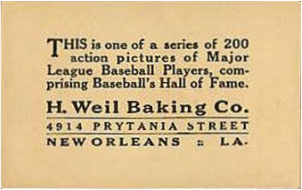 According to the ad on the reverse of these cards, H. Weil Baking was located at 4914 Prytania Street in New Orleans. The article below has them listed at 4908 Prytania St. 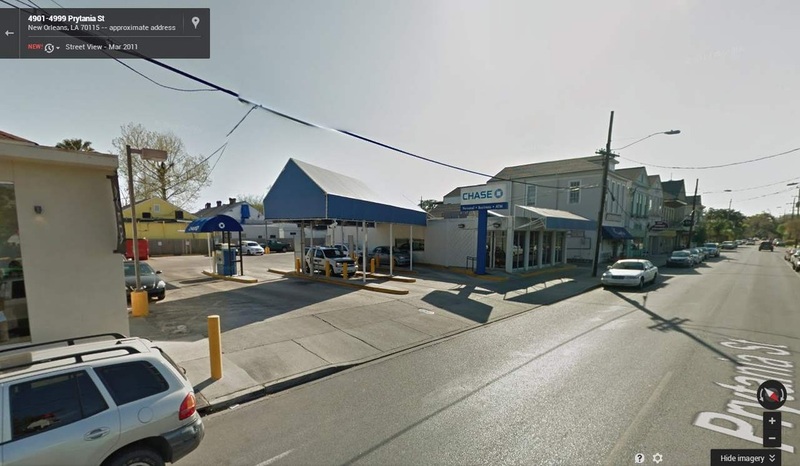 There is currently a Chase Bank occupying that section of Prytania. The Weil Baking building is no longer there. Former H. Weil Baking building on Prytania St. Section of 4900-4920 Prytania today. The old building was razed and a Chase bank occupies the location. Note the building just behind the Chase bank. 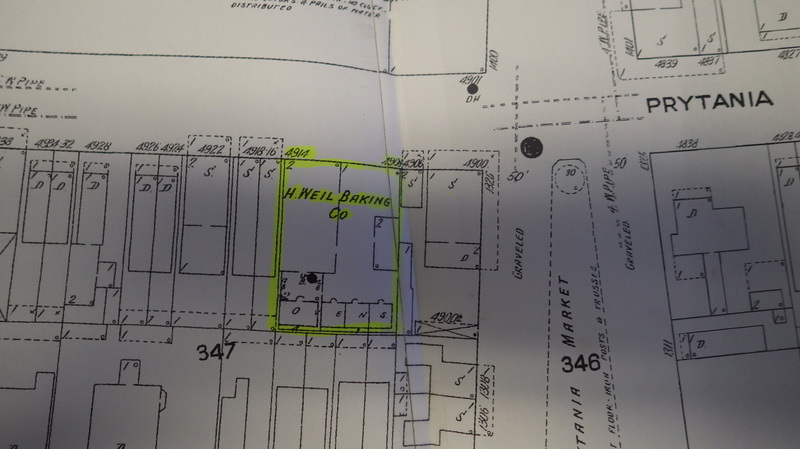 It appears to be the same building in the photo showing the old H. Weil building. 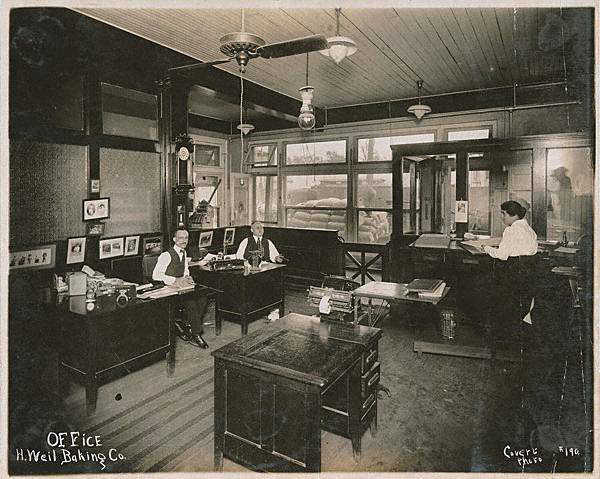 Weil Baking Co., 4908 Prytania.—The plant of the Weil Baking Co., is considered the most efficient bakery in New Orleans. In the shop of this bakery, machines can be found, which the owner can claim are at present the only ones of their kind used in the manufacture of bread in New Orleans. Our readers must consider that New Orleans is the home of French bread in America. More French bread is baked in this city than perhaps in any other city in America. Machines can be used only to a certain degree in the making up of this particular bread. The Weil Baking Co., in spite of this and many other obstacles, has machines in its shop, which New Orleans bakers not so very long ago would never have dreamed of seeing in operation in their city. Mr. Weil started in business about twenty years ago. In 1906 the stock company was formed and decided to build up an entirely new plant, which was erected in the very first year. The building itself has a very pleasing exterior. The top floor is used for storage of flour, with a capacity of 3,000 barrels. The flour is hoisted up by means of an especially constructed flour hoist. The flour sifting and blending outfit is of the Wolf system. On the same floor we found also the dough and mixing room. Two Champion mixers are on duty here. One of the mixers is a high-speed apparatus. Both machines are equipped with automatic flour and water scales. In the same room is also a Day dough brake. Also, on the top floor, there is a dressing room, equipped with shower baths, individual lockers, etc., for the convenience of the bakers. The shop is located on the lower floor. Here we see the following machines: An automatic dough divider and a rounder, both machines having been furnished by the American Bakers' Machinery Co., St. Louis, Mo. Further, there are a Thompson extension moulder, two roll dividers, a Temple-Hanna cottage-loaf machine, and an automatic proofer, the latter made by the American Bakers' Machinery Company. The proofing of the bread is done in up-to-date steam boxes. The bread is baked in four Duhrkops and two Gorndt ovens, fired from the rear. The wrapping and loading room and the elegant office are located on the same floor. About 55 people are employed, among whom are 24 bakers. Nine wagons and three autos are utilized. The trade is mostly wholesale and a nice shipping trade has been worked up. Use about 50 bags of flour a day. The firm's specials are Pan Dandy and Butter Nut bread. Bread and buns are the only goods baked by this firm. So far as the sanitary conditions in this plant are concerned I can truly say, that they are unsurpassed. Every working room is on the surface, high, roomy and light. Fresh air is circulated in every nook and corner of this bakery, and helps make this sunlit shop of the kind that places the modern baker among the cleanest food producers on earth. 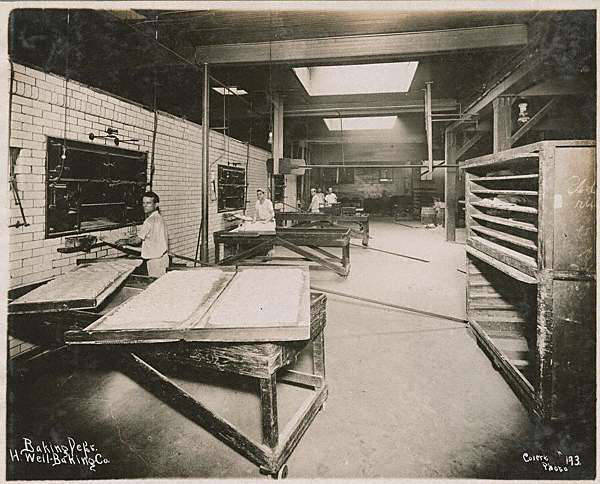 The firm's upright and square business methods, combined with the A-1 quality of their goods, caused this model bakery to become one of the largest plants in New Orleans. The officers of the company are: H. Weil, president and Leon Salmon, secretary and treasurer. 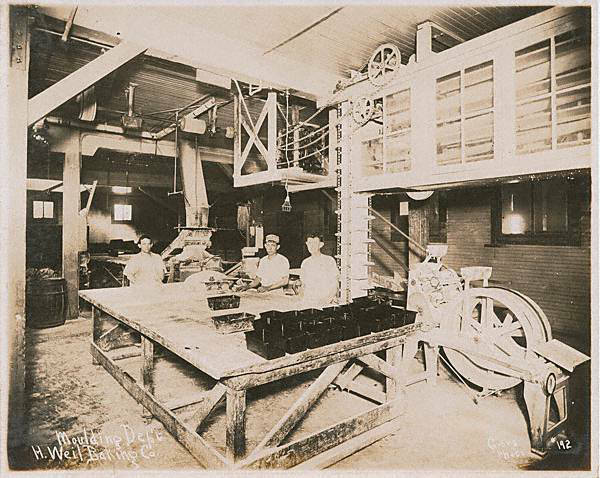 Workers standing at the ovens in the baking dept. Workers in the moulding dept.